"I'm tired of doing the impossible for the ungrateful." Sony has debuted the first trailer for Nightcrawler director Dan Gilroy's new film, Roman J Israel, Esq., which premiered at the Toronto Film Festival to fairly negative reviews unfortunately. This is the film that stars Denzel Washington as an overweight Los Angeles lawyer with an afro, fighting for justice in a troubled legal system that fights back. Also starring Colin Farrell, Shelley Hennig, Carmen Ejogo, Nazneen Contractor, Tony Plana, and Niles Fitch. All the early photos from this definitely got my attention, but the bad buzz out of TIFF (saying it's a mess that doesn't amount to much) has deflated my interests just a bit. I'm still curious about seeing it, and the footage in this trailer actually looks promising. I'm actually more hopeful now, thankfully. Fire it up below. A dramatic thriller set in the underbelly of the overburdened Los Angeles criminal court system. Denzel Washington stars as Roman Israel, a driven, idealistic defense attorney who, through a tumultuous series of events, finds himself in a crisis that leads to extreme action. Colin Farrell costars as the monied, cutthroat lawyer who recruits Roman to his firm. Roman J Israel, Esq. is both written and directed by American filmmaker Dan Gilroy, who made his first directorial debut with Nightcrawler after writing the scripts for Freejack, Chasers, Two for the Money, The Fall, Real Steel, The Bourne Legacy, Nightcrawler, and Kong: Skull Island. This first premiered at the Toronto Film Festival just last month. 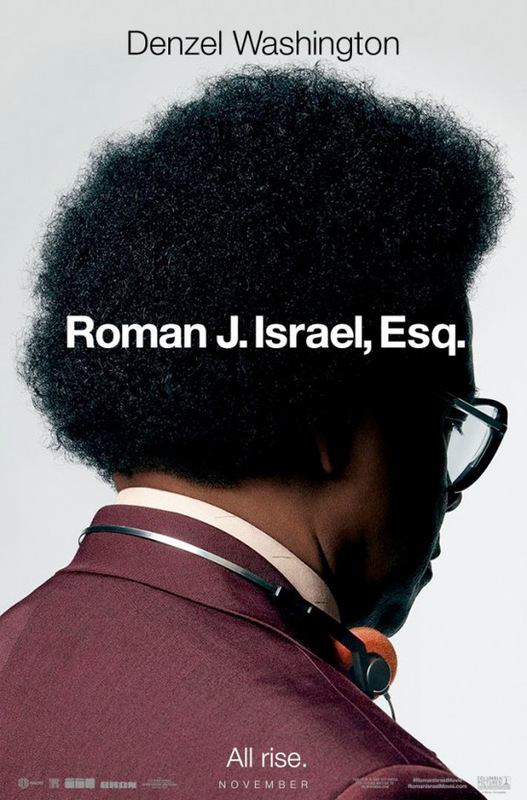 Sony Pictures will release Roman J Israel, Esq. in theaters starting November 3rd this fall. First impression? Who's down?